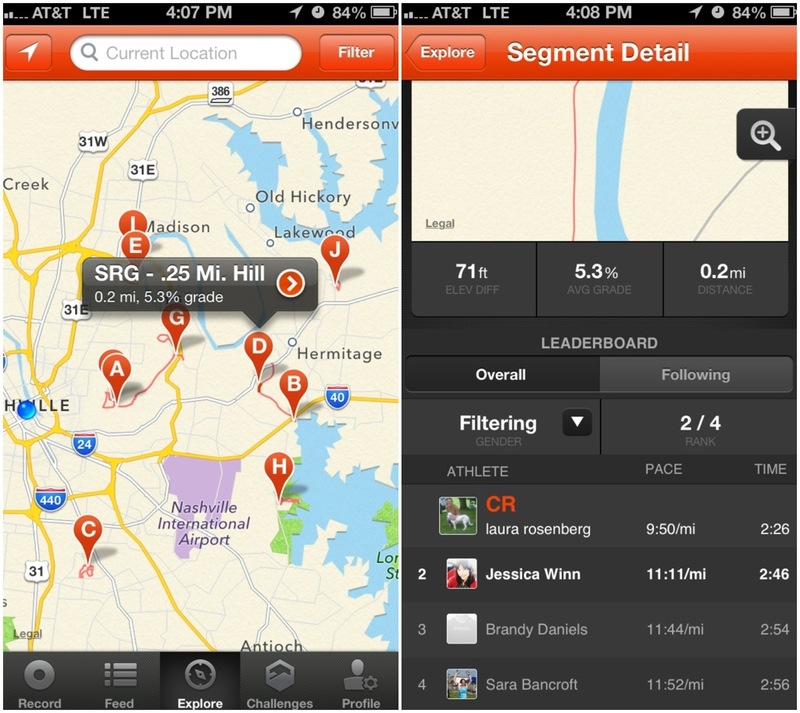 Strava is a neat little iPhone app, used for tracking runs and biking. You can use it to log your runs with GPS or you can also use a handy tool that automatically syncs your Garmin data to Strava (this is what I do). The main feed shows all of your recent activities, as well as those of your friends. You can comment on others’ activities and give them kudos. When you click on an activity, it shows you a map, along with times and pacing information. 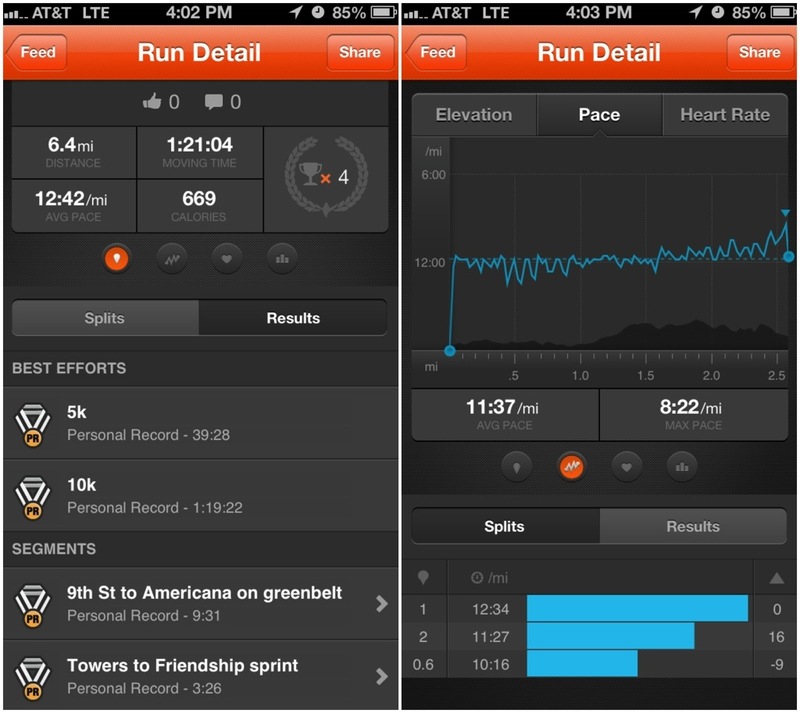 Strava has my favorite pacing chart of all the apps I use. I like the bar graph format on the main activity page (above), and the line graph (below) does a perfect amount of smoothing (compared to Garmin’s which doesn’t do enough smoothing and Nike’s which does too much) so I can get the best idea of how steady my pace was. Like the Nike+ app, you get achievements. But in Strava you get a lot more of them. (Never a bad thing!) You get achievements for normal PR type stuff, but also for running segments, which are user-defined routes and hills (more on those in a second). The app has a nice graph that shows pace overlapped with elevation. And it shows your max pace (which none of the other apps I use show at all…I love seeing how fast I was running, even for a split second). It will also show heart rate data too (on those rare occasions when I actually wear my HR monitor; it usually makes me too sweaty). 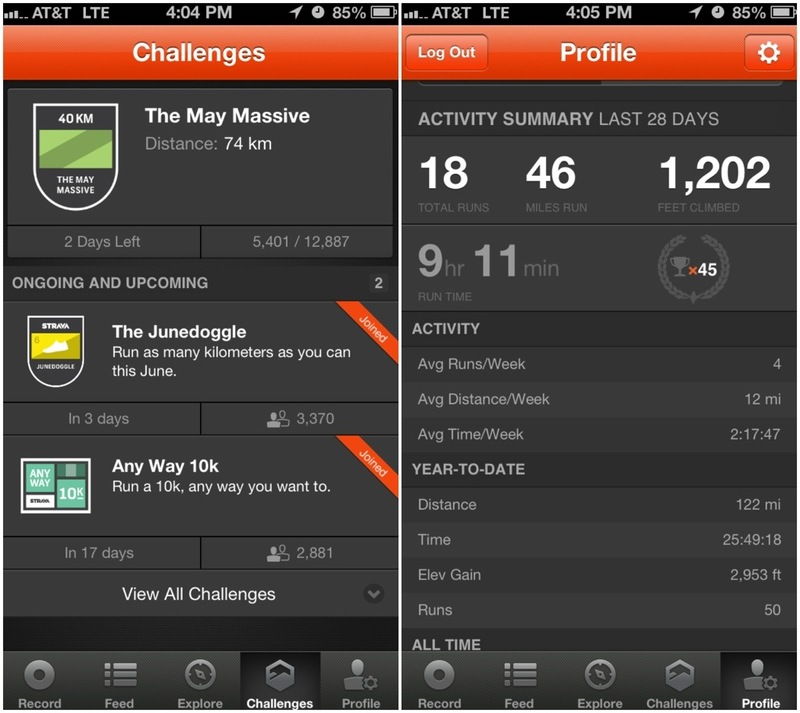 Strava has also recently implemented a new Challenges section. The first challenge I’ve signed up for hasn’t ended yet, so I’m not sure really what will happen, but it seems like a great way to keep myself motivated. Finally, there’s the profile page, which shows your averages and totals. 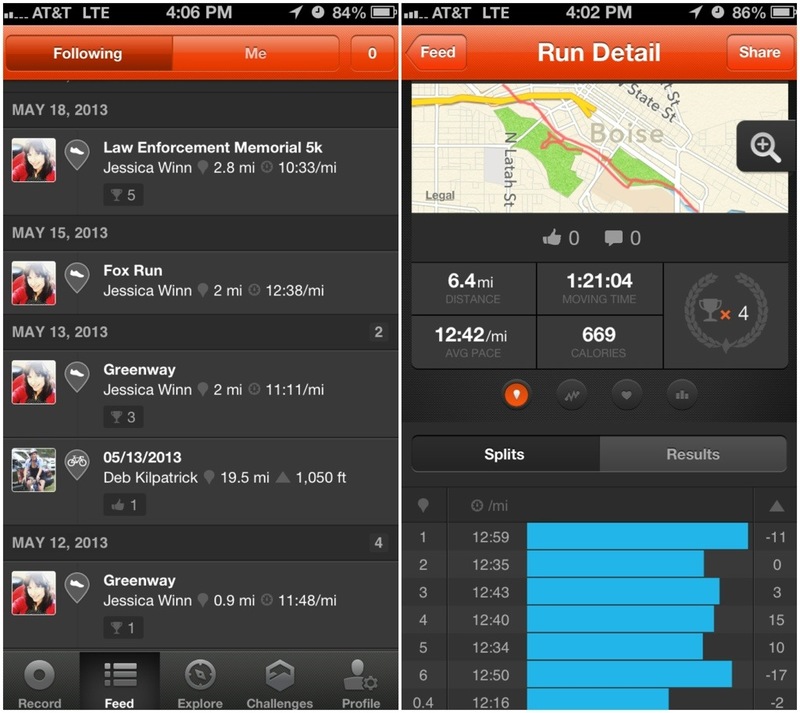 So what don’t I like about Strava? There’s not much. It’s my favorite go-to for data, even though I post screenshots from Nike+ more (just because I think it’s prettier to look at). I love that I can use my Garmin data. The website also has a feature where you link up your Instagram account, and it detects any photos you post while you run! The only thing I can think of that is missing from the app interface is a list of your current PRs (though you can find those on the website). Download it! This entry was posted in Gear and tagged iphone app, strava. Bookmark the permalink.